Every month on the last Tuesday except December. 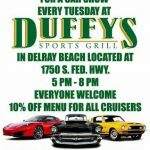 Hosted by the Florida Corvette Club, “The Most Active Club in the State”. A great social club that offers socials and road trips each month as well as supports a number of charities each year. Open to all Corvette owners to come and mingle with the club members. Do not need to be a member to attend.